What’s happening with distressed properties? To gain a better understanding of the market, it is critical to understand the market for distressed properties. 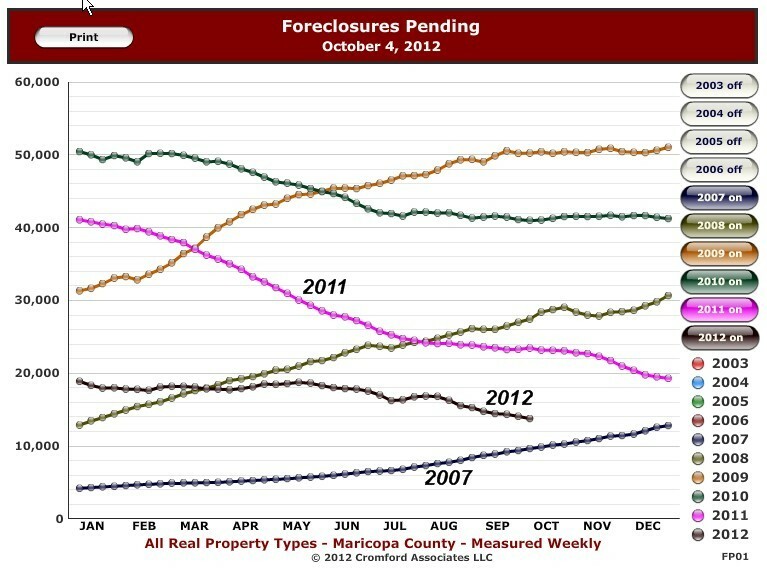 I like this graph to the right because it shows the pending foreclosures over time. The decrease which began in 2010 and accelerated in 2011, shows why foreclosures have seen a significant reduction during 2012. It is very likely that it will fall below year-end 2007 levels by the end of this year. Pending foreclosures are the fuel for the foreclosures/short sale pipeline so this trend shows that the real estate market is heading towards normalcy. 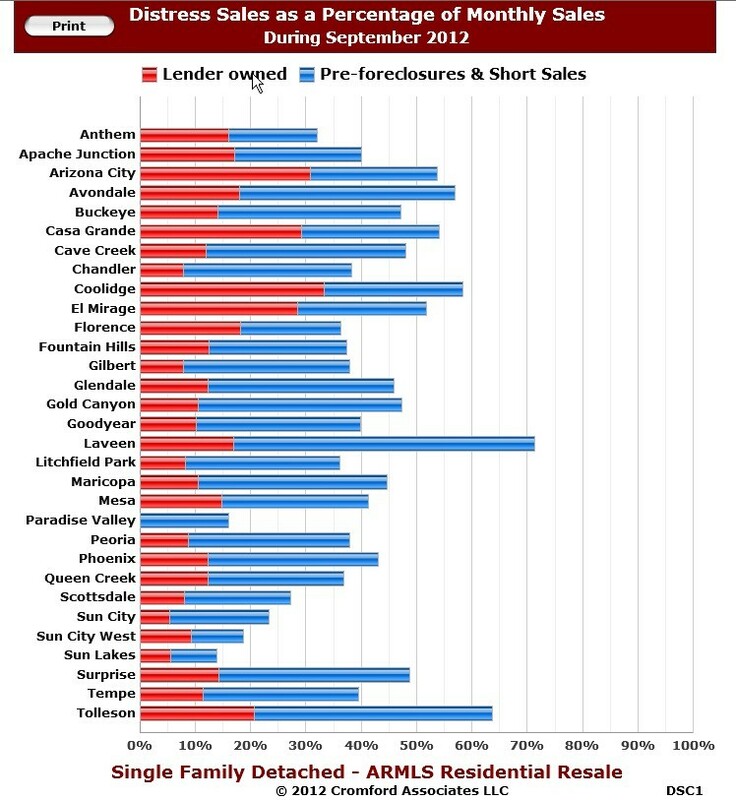 The specific impact of the reduction in distressed sales can be seen in the graph to the left which shows the percentage of distressed sales by city broken down by foreclosures and short sales. To appreciate where we’re at, we must look back a year ago. 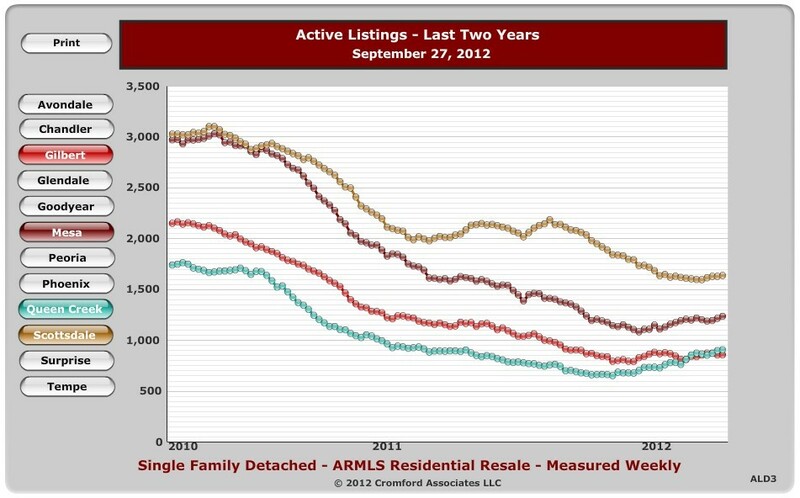 Nearly all cities have experienced a double digit reduction in the percentage of distressed sales from a year ago. Instead of torturing you with another graph, I’ll give you the summary. This is over a 12 month period which equates to a 2% decrease per month in many areas. Distressed sales, foreclosures and short sales, will still be around for a while but the trend continues to be extremely encouraging. What happens when home values rise? As distressed properties (foreclosures and short sales) are decreasing and home values are rising, this is welcome news to underwater home owners . Before, these home owners could not voluntarily sell their homes. Rising home values provide the opportunity for more owners to participate in a traditional sale which allows more homes to come on the market. 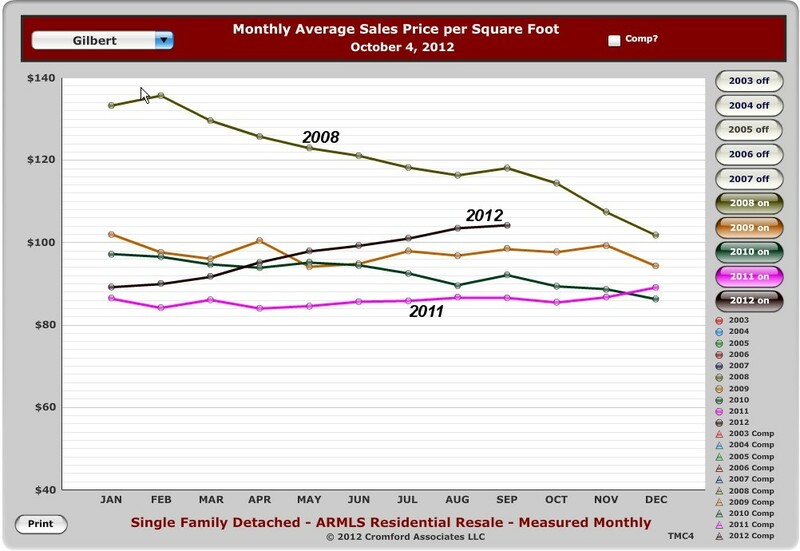 Since the 3rd quarter of 2011, the increase in prices has been driven by the lack of supply of homes for sale. In order to view the balance between supply and demand we must refer to, you guessed it another graph! The months of inventory graph to the right shows that balance between supply and demand. A rise in the available homes for sale with constant demand increases the months of supply because it takes longer for that demand to consume the supply. We are already seeing an increase in the months supply in many cities which means that as prices increase and more homes come on the market, it will take longer for homes to sell and the rate of increase in prices will slow down. 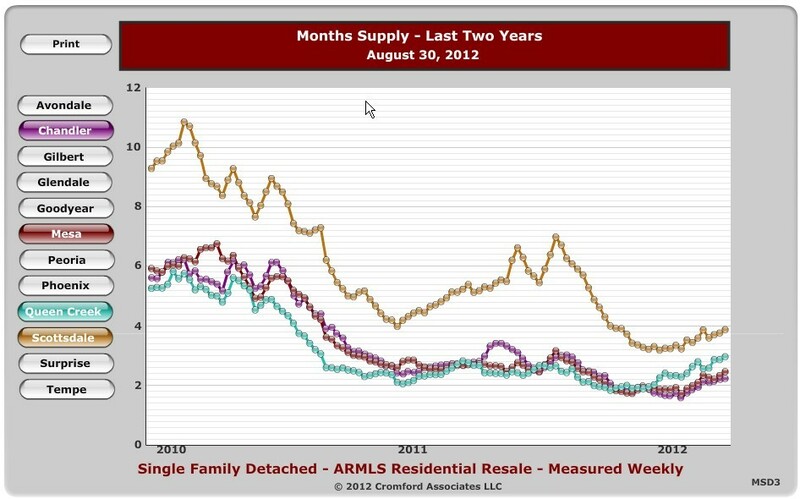 A six month supply of homes is consider normal so our market is still very healthy but an update trend indicates a cooling off. One of the hottest market segments has been lower priced homes that can be purchased and rented out with immediate cash flow offering a significantly better rate of return than other investment alternatives. As prices increase, the ROI comes down and a point will come where the reduced return does not justify the investment and investors will be leaving the market. As the Phoenix housing market returns to what may be close to a normal market, prices will continue to increase but will be moderated by an increase in the supply of homes. Phoenix was one of the first markets hit by the bubble so the fact that we’re one of the first ones out should not be a surprise. Foreclosures and short sales will continue to be part of the equation but a smaller percentage. Look for continued appreciation in 2013 but not the frenzied price recovery that we’ve seen in 2012. 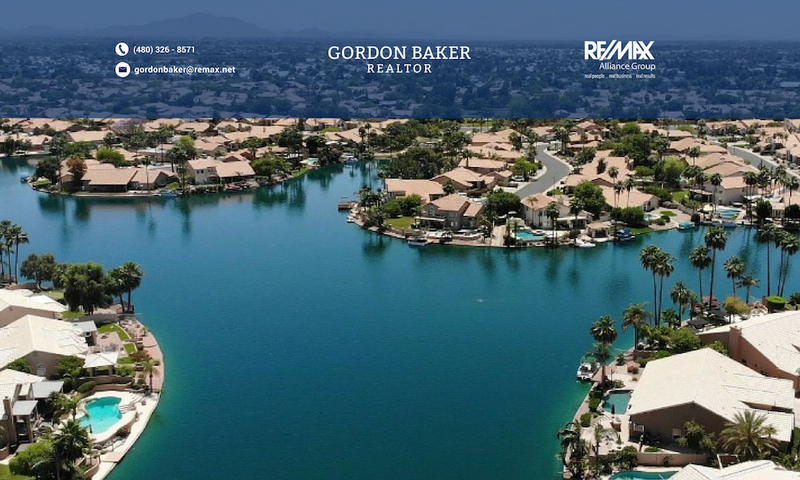 To receive updated properties of homes in the Phoenix area, click on Receive property listings via e-mail and describe the home you’re looking for in detail. Where’s the Phoenix market going in 2012? Meticulously maintained home ready for the pickiest buyer! Sellers have really cared for this home. HVAC system and pool equipment have been upgraded to energy efficient equipment. Other recent improvements include pool pebble tec resurface, exterior paint, new patio roof, and water heater. Open floor plan with 3 bedrooms and 2 baths. Split master has separate entrance to pool. Master bath has separate tub and tiled shower, dual sinks and walk-in closet. Granite counters, stainless steel appliances and large pantry in kitchen. Three car garage with built-in cabinets and garage door openers. Amazing back yard with pool, covered patio the length of the house, built-in BBQ and large grassy area. GREAT location in gated community of Park Village. You will love this one - super clean, with neutral paint and flooring throughout. Just painted and brand new carpet. Come see this 3 bedroom, 2.5 bath hidden gem, in CHANDLER!! You will not be disappointed. Spectacular residence in Chandler! 5 beds, 3.5 bath BASEMENT home has it all! *Over 1/2 ACRE CUL DE SAC LOT professionally landscaped & perfect for entertaining 3 car garage, and RV gate. Interior boasts great attention to detail & breathtaking beauty! New Interior Paint Travertine tile, wood flooring & new neutral berber carpet wood shutters, ceiling fans, security system, central vac, surround sound, epoxy finished garage, soft water/RO. Extended Great room, family room w stone/fireplace Open light and Bright - Kitchen w/granite countertops, tile back-splash, Gas Range, tons of storage, and island w/breakfast bar. Spacious master retreat has backyard exit, plantation shutters, and walk-in closet. Basement includes a large game room, along with 2 bed and a bath and storage room. Your search ends here! The demand is high for homes within the Rancho Collene community so come take a look! This popular model has 4 bedrooms, den, plus an oversized bonus/game room. Secondary bedrooms are large with 2 having walk-in closets. Like to entertain? Perfect! The lower level offers a formal dining room, living room, large family room plus beautiful kitchen with double ovens, island, walk-in pantry, snack bar and breakfast nook area. Outdoors you have a private pool, spa, covered patio, and large grass area. The 3-car garage has built in cabinets and plenty of storage space. Stop by today! This is it! Drive up through beautiful tree-line streets in this lovely community to your new home! Awesome kitchen open to living area. Spacious kitchen has large pantry, lots of cabinets, granite counter tops, and island breakfast bar. Incredible master suite with his/hers walk in closets, split double sinks, separate tub & shower. Two additional good sized bedrooms & another full bath & laundry room also on upper level. Side yard even has a space to entertain, with firepit. This community offers swimming pools, play parks, basketball/volleyball courts & biking/walking paths. Highly desired location close to the 202 freeway, San Tan mall, great restaurants and other entertainment. Don't miss this one! Stunning single level home on the LAKE! Complete REMODEL with over $100k in upgrades including new CUSTOM POOL! Newly remodeled gourmet kitchen, quartz counters, upgraded cabinets, new backsplash, all new appliances, new sink, bosch dishwasher garbage disposal, extended kitchen island. Open floorplan with new 6x39 plank tile, new carpet, 5 inch baseboards. Fresh paint inside. All new brushed nickel hardware, designer LED lighting, new light fixtures. SMART home, lighting and a/c controlled by Alexa. Ring doorbell, new electric fireplace. All bathrooms remodeled with new vanities toilets and sinks, new ceiling fans. Garage wired for Tesla charging. Backyard has been landscaped, extended pergola patio, new drip system and sprinklers, pool has colored lighting and water feature! Discovered your site while surfing national waterfront homes websites. Really like the structure and focus on themed searches! I’ll keep you in my CMS as a Phoenix Realtor referral.